It is widely accepted that writing essays can be challenging. The admission officers go through thousands of profiles, and read, thousands of essays. It is obvious that, most essays will have a great deal of similarity. So, you must strive hard, to make your essays sound different, and more compelling. How do I make my essay look different and better than others? To make your essays look different, you have to brainstorm continuously, and focus on your all round aspects. Focusing on your personal aspects, will greatly help in adding value to your essays. As mentioned before, you cannot afford to take your essays lightly, as they are mandatory and carry a specific weight to your application. Your essays can be a medium through which, you can highlight your key skills, your attributes, personal qualities, and unique traits. The admission officers need a specific set of skills, and a specific kind of candidate, to fill in their class. Remember, it is your responsibility to convince them, that you are the one they are looking for. What kind of essays will I be asked to write? Suppose, you have coached an under-14 football team. Now, you want to share your experiences, by writing a compelling essay, based on the above situation. Why do a lot of essays get rejected? Remember – It is more about how you write rather than what you write? While writing an essay, you must ensure that it should be written in a proper sequence. You can summarize your essay, by breaking it into parts or paragraphs. You must jot down the key points, before writing down the entire story. In the first paragraph, you should give a convincing introduction to the challenges faced by the team. For example- you can say, initially, the parents did not allow their children to play football, as the kids were not disciplined. The kids did not arrive in time and lacked the team spirit. In the second paragraph, you can mention, the preventive actions taken by you. For example, like- explaining the parents about the importance of sports, encouraging the students to work as a team, or conducting ice breaking sessions, that allowed free mixing, and promoted friendship between the kids. In the third paragraph, you can talk about the motivational actions taken to resolve these problems. For example, like- encouraging children to arrive in time by rewarding them for their discipline. You can also say- team work was a problem, so I encouraged my students to pass the ball frequently, and after the session was over, I used to reward those kids, who frequently passed the ball. This improved the teamwork skills. In the fourth paragraph, you can talk about the results- whether they were fruitful or they backfired. You can say, after I took the preventive measures and motivational actions, the team was more disciplined, and started winning more matches. So mention things like we competed with great spirits, and finally won the all-important trophy. In the fifth paragraph, you can mention the “takeaways”, or the outcome of your efforts. You can say, after the team won, the team spirit was at its peak. The parents congratulated, and thanked me for my efforts. The kids were thrilled, and I got immense respect. We managed to pull off something, which seemed impossible a few months back. That gave me immense joy and satisfaction, as my hard work paid off. Now from the above example, it is evident that, the essays should be structured, and written in a proper sequence. You have to back your points with relevant examples. An essay which is narrated with the help of real life examples, adds authenticity to your application, and plays a big role in differentiating your profile from other applicants. At Manhattan Review (MR), we have experts who have studied and worked abroad and are experts in editing your essays for MBA, MS and Bachelor’s programs. Our services helped hundreds of students join elite schools such as Columbia, LSB, Purdue and hundreds of others. Would you like your essays to be as effective and successful? We are just a step away! Contact any of our offices or call us (contact details on our website www.manhattanreviewindia.com). Your second step could land you in your choice B School in USA or elsewhere in the world. We are pleased to inform you all that your favorite company has a new address on the internet. All our students can access www.manhattanreviewindia.com for our services, latest updates, information and assistance with your plans. The site is more user-friendly, easy to navigate, attractive and Social Media-friendly! Visit our website and let us know your comments. Admissions for our students have started happening. 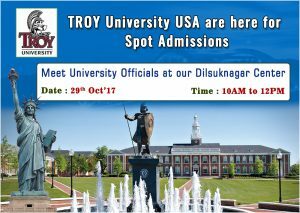 Quite a few of our students have been admitted in various US universities and they are awaiting their I-20s to start the visa process. Wish you all the best aspirants! Be sure, we are and will be with you till you fly! Our ‘Spot Assessment and Admission’ sessions with various US universities have been a very big hit. Many of our students got admission into programs of their choice, especially with scholarships worth $ 8,000 to 2,000 per year. We look forward to our upcoming ‘Spot Admission’ sessions on 23rd February at our Manhattan Review Adayar (Chennai) and Manhattan Review Tarnaka (Hyderabad) centers. Students, if you have completed or in final year of your education and have all your credentials (test scores, 3/2 marks etc.) you will be given ADMISSION and SCHOLARSHIP OFFER ON THE SPOT! For more details, contact of our centers nearest to you. Make sure to keep all your documents ready and get admission with scholarship/funding. Tags:MS Admission process, Best MS Admission Services, ms admission, Best GMAT, GRE, SAT Coaching in Hyderabad, Bangalore, Chennai, Guntur, vizag, Vijayawada and Tirupati.